MISSION, KS--(Marketwired - Oct 5, 2015) - (Family Features) With football season in full swing, throwing a winning tailgating party is a must. Fire up the grill and mix up some great cocktails to keep your party going strong from kickoff to the final horn. This year, take your game to new heights by putting an unexpected twist on traditional tailgate eats and drinks. Ditch the wilted stalk of celery and soggy slice of bacon, and bolster your Bloody Mary with any variety of sausage -- a game-changing play sure to turn heads, experiment with different flavor in your garnish and earn the respect of your comrades. A Bloody Mary is more than just a crave-worthy cocktail. It's a spectacle, a cultural phenomenon and an opportunity to make a statement at your next tailgate party. Find more game day recipes worth cheering for at Johnsonville.com. In shaker or pitcher, mix vodka, Bloody Mary mix or tomato juice, okra juice, Worcestershire sauce, hot sauce, celery salt and black pepper. Pour into 4 glasses with ice. For garnish, assemble each skewer with smoked beef brat and okra spear and place into cocktails. In pitcher, mix vodka, Bloody Mary mix or tomato juice, horseradish sauce, hot sauce, lime juice and pepper. Pour into 4 glasses with ice. Assemble grilled brat in bun and slice into four pieces. 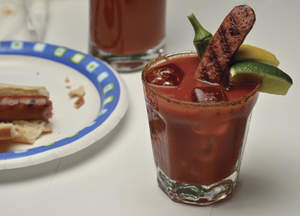 For garnish, assemble each skewer with one quarter of brat with bun, one cheese cube and half dill pickle and place into cocktails.